With vonblum we have the good fortune of meeting lovely people also in the blog world. One of our new acquaintances is Pam from Housemartin, a blog literally blooming with beautiful ideas. Now, just like us, she is in the process of opening her own store. 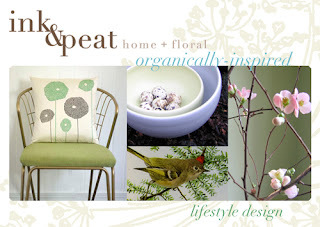 Ink and peat will be a floral and lifestyle store, filled with the beautiful flower arrangements in Portland, USA. If you happen to be in Portland next spring, you know where to go first. Meanwhile in Europe we continue reading your posts and receiving your floral notes.